First of all, please disregard the TERRIBLE photo below. I did not have the right lens for my camera, so this was the best I could do. A while back I saw this on Tara's blog. Well...I actually think I followed a link off of another blog to Tara's blog, but anyway, I was inspired. I loved it! I really didn't have a great place for such a photo display in my house, but Mom did. I showed her and she loved it too, so...here we are almost an entire year after I first saw it and it is finally complete (for now). The hardest part was getting all the pictures together. Ideally, she wants one of Victor and I, but until we get a good one, she has an extra one of my handsome nephews. This display "greets" you as you enter the house. I used a TTV overlay from Flicker and edited my pictures in photoshop. I followed a tutorial I found online (unfortunately I don't have the link). 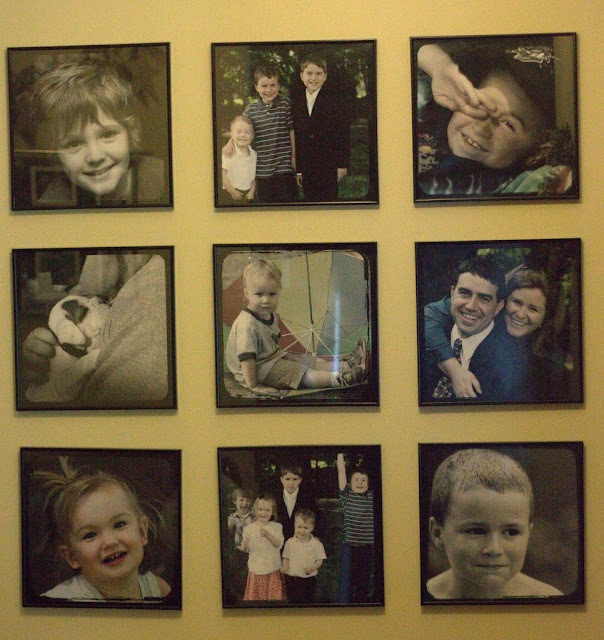 All the frames are simple 12 x 12 scrapbook frames from Michael's.